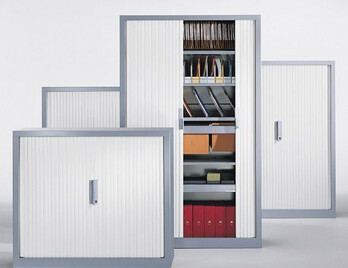 Tambour units are useful as they have a large capacity for storing files, boxes and stationery. Metal shelves are often featured with metal to metal fixings offering a sturdy platform for all your storage needs. 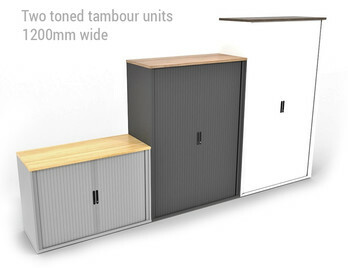 The internals of tambour units usually consist of standard shelves, roll out filing frames, roll out shelves and shelves with divider packs. 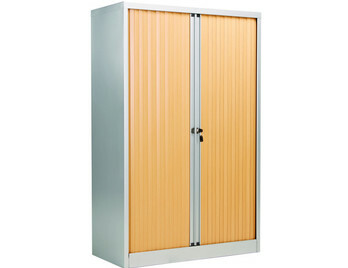 Within this section, you will find metal tambour units with PVC shutter doors and wooden tambour doors both units are available at different heights and widths. 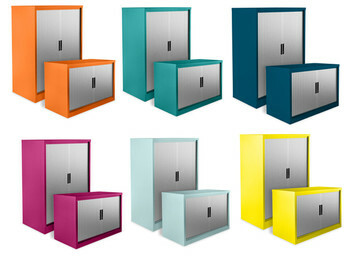 Why not add a splash of colour to your offices with the Jester range or the Scope range of units? 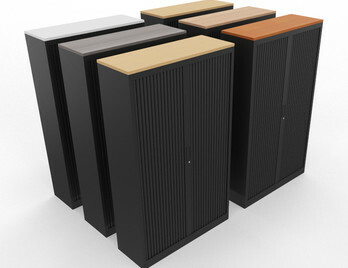 Or create your own combination of two-tone units with the Avalon prime or B two-tone units. 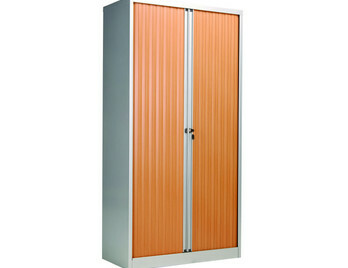 Please do not hesitate to contact us to discuss your storage needs. 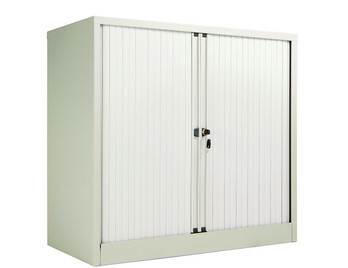 Great value metal tambour cabinets available from stock for a free next day delivery with PVC shutters in a choice of two colours grey, beech or oak doors with a durable steel carcass in a Silver Grey colour. Comes with a five-year factory guarantee. 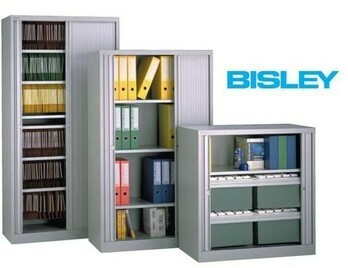 Bisleys systems storage cupboards with tambour doors slide and retract smoothly to save space and offer access to the entire cupboard offering practical storage solutions for any office. 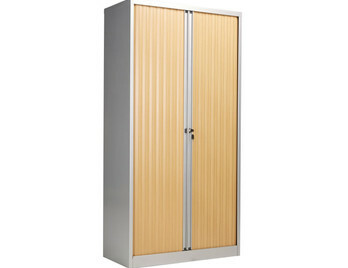 Offering good security, the tambour doors recede smoothly into the cabinet carcass leaving office aisles and walkways unobstructed. 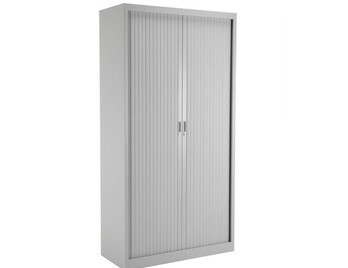 These Next day metal tambour cabinets in three height options available for free next day delivery. 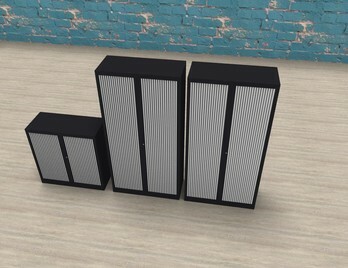 Available in white, light grey and black with sideways opening shutters. Comes with a seven-year factory guarantee. 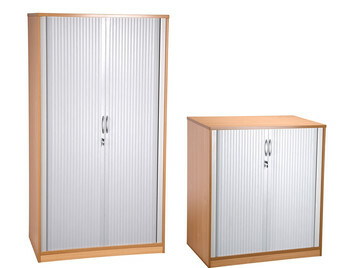 Next day metal tambour cabinets in three height options available for free next day delivery. Available in light grey with sideways opening shutters. Comes with a ten-year factory guarantee. 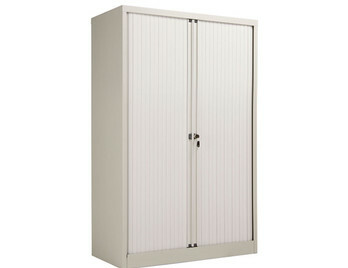 Next day metal tambour cabinets in three height options available for free next day delivery. 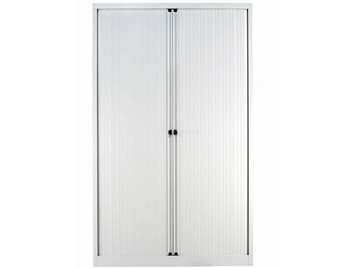 Available in white, light grey and black with sideways opening shutters. Comes with a ten-year factory guarantee. 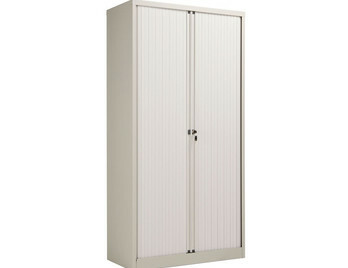 Large tambour cupboard that is available for a free UK mainland delivery service and has a choice of contrasting carcass and shutter colours. Available in 7 - 10 working days from order. 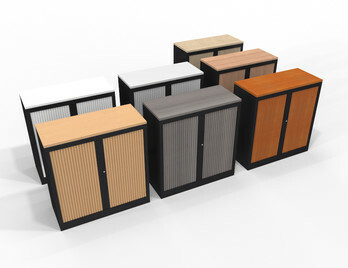 Metal tambour cupboards with a choice of 24 carcass colours and four height options. 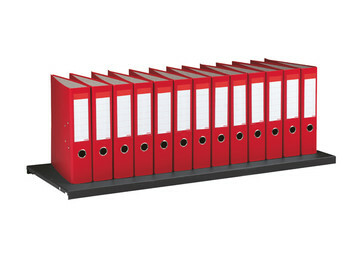 Manufactured to a high standard in the UK and delivered within a 7 - 15 day lead time as standard. 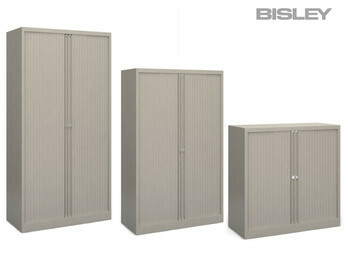 Metal tambour cupboards in a choice of three finishes and three heights. Fully welded carcass delivered assembled. 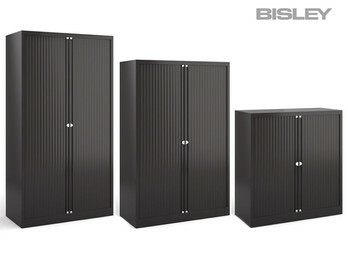 These cabinets are held in stock for free next day delivery. 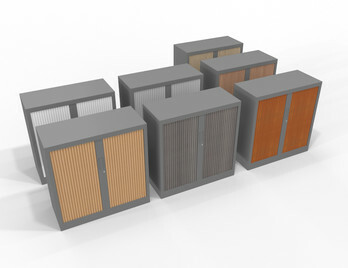 Metal tambour cabinets with contrasting wood effect shutters in a choice of five colours. Carcass is available in Anthracite, White or Aluminium Silver. Available from stock in 5-7 working days. 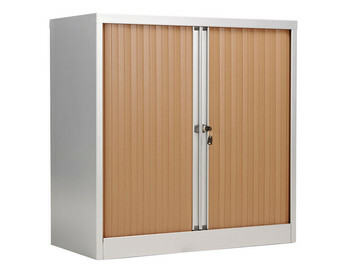 Metal tambour cabinets with matching shutters and wooden finishing tops. 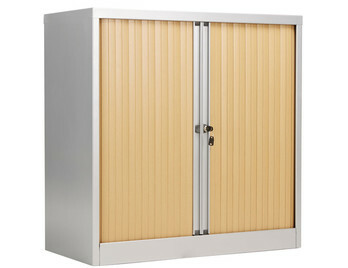 These tambour cabinets are a one-piece welded structure and feature lockable shutters with two keys supplied. Choose between two widths and three height options for your own personalised design. 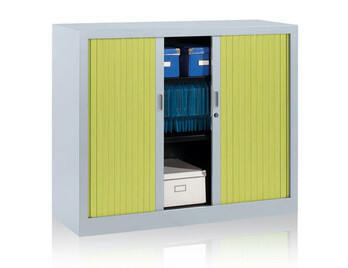 Tambour cupboards in a wide range of colours with shutters in Blue, Lime Green or White. Choose from seven height options. Manufactured in the UK for a 15-20 day lead time. 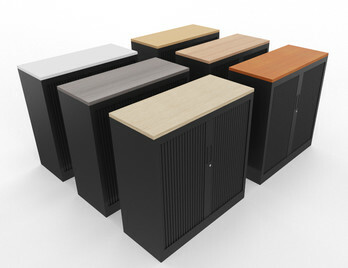 Wooden tambour cupboards in a choice of five height s and 15 carcass finish option. Silver finish shutter as standard. Comes with free delivery and free installation. 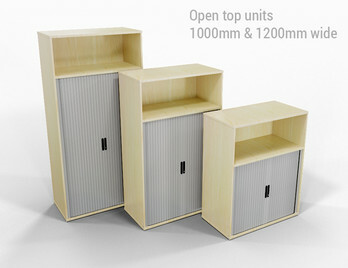 Sideways opening wooden tambour cupboards, 1200mm wide for extra storage capacity. Carcass in a choice of 15 finishes. Smooth running tambours in a choice of four finishes with black hand grips. 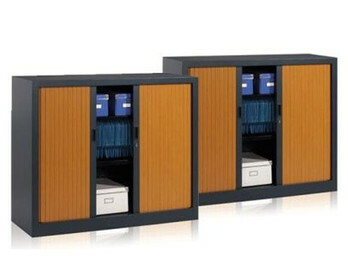 Tambour cupboards from the Avalon range with upper open section. Chose from three height and two width options. 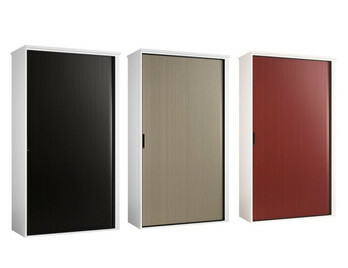 Carcass is available in a choice of 15 finishes. Comes with free delivery and free installation. 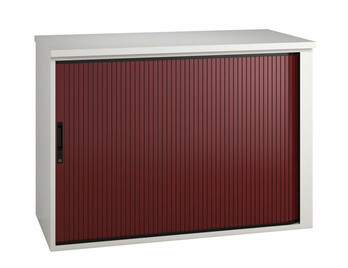 Two-tone tambour cabinets with PVC shutters in a choice of three colours and a durable MFC carcass in 15 finish choices. Manufactured in the UK and comes with the free delivery installation. Accepts 1000mm internals shown above. 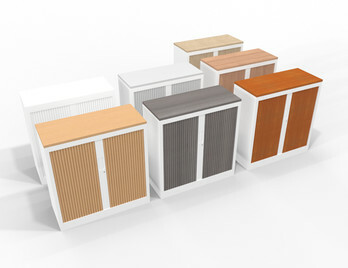 Two-tone tambour cabinets with PVC shutters in a choice of three colours and a durable MFC carcass in 15 finish choices. Manufactured in the UK and comes with free delivery installation. Accepts 1000mm internals shown above. 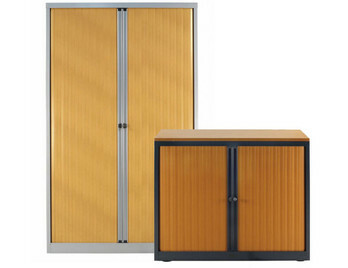 Part of the MW range of office furniture, these tambour cupboards are available for a free UK mainland delivery to most areas and are available in Beech or Light Oak. 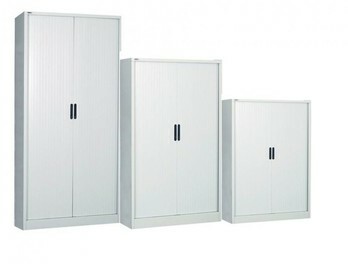 These cupboards can be delivered flat packed or assembled within 7-10 working days from order. 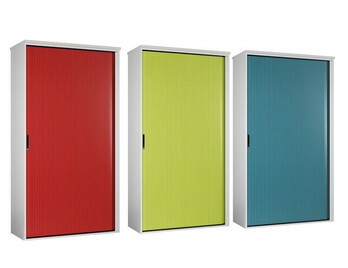 Available in four heights and three widths with carcass and shutters in four colours. Quality welded construction available for delivery in 7 - 10 days with free delivery and installation. 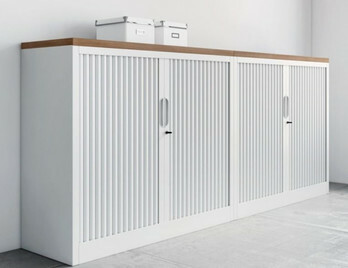 Tambour cabinets with White or Silver carcasses and shutters or in contrasting Apple and Light Beech wood effect shutters. Available for delivery in 7 - 10 days and comes with free installation to mainland UK. 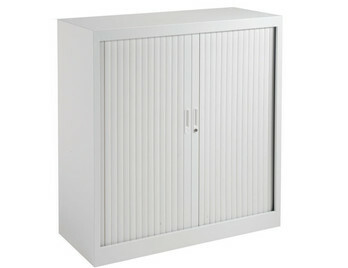 Tambour cabinets with colourful, lockable shutter doors and a welded carcass in White or Silver powder coated finishes. 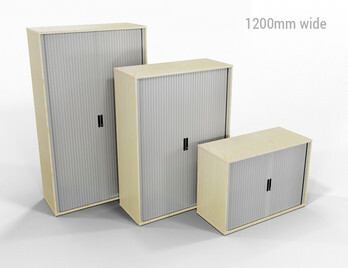 Comes in a choice of two heights and free installation to mainland UK addresses. 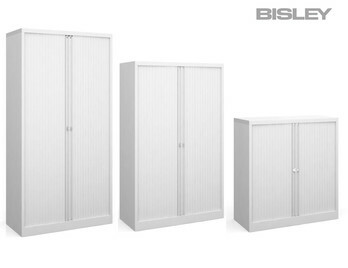 Stunning wide opening tambour cabinets with coloured shutters and a White wooden carcass in a choice of two height and four delivery options. Stunning wide opening tambour cabinets with feature metallic blue shutters and a White wooden carcass in a choice of two height and four delivery options. 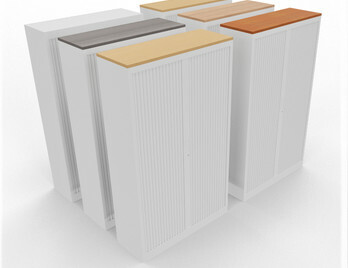 Stunning wide opening tambour cabinets with shutters in a choice of four colours and a White wooden carcass in a choice of two height and four delivery options. Manufactured in the UK and covered by a ten-year factory guarantee. 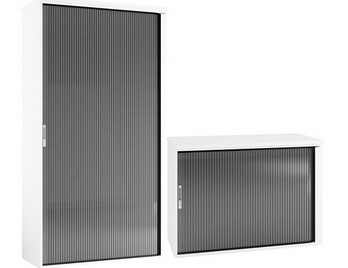 Aegis side opening tambours are stocked in grey and white steel and feature a quality welded construction. 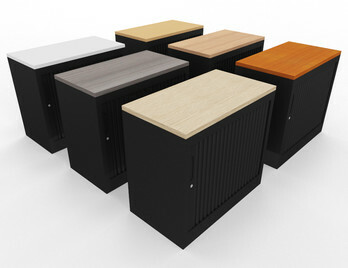 They come complete with shelves, each of which has a 50kg loading. These units are available on a next day service. 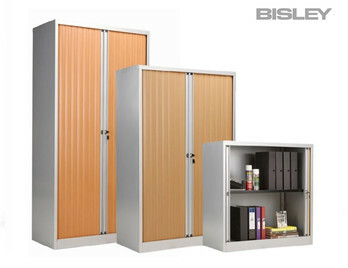 Bisley is a well-known name in the office storage industry and these range of tambour units are well equipped to meet the most demanding storage requirements. 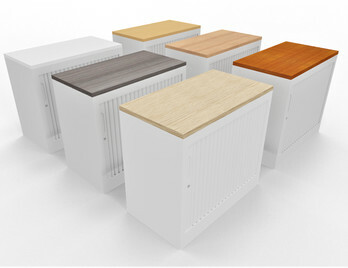 These units are available on a next day delivery service (kerbside only) or delivered and installed to a room of choice on 7-10 day delivery. 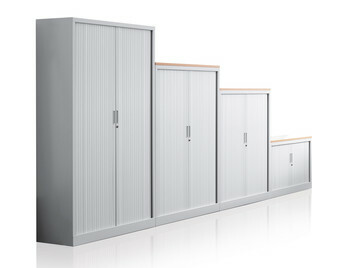 B-Mono metal cabinets with PVC tambour doors represent an effective solution for lateral filing and archiving, due to the optimised capacity in ration top to the reduced footprint allowed from the tambour door. B-Mono is a monochrome colour where the doors match the carcass in either Aluminium, Anthracite, White or Grey with optional decorative contrasting finishing wood tops. 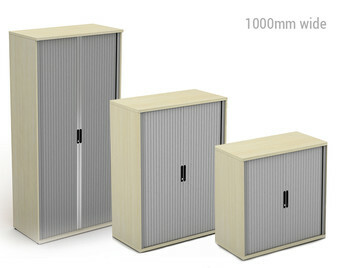 B-Mono metal cabinets with PVC tambour doors represent an effective solution for lateral filing and archiving, due to the optimised capacity in ration top to the reduced footprint allowed from the tambour door design. B-Mono is a monochrome colour where the doors match the carcass in either Aluminium, Anthracite, White or Grey with optional decorative contrasting finishing wood tops. 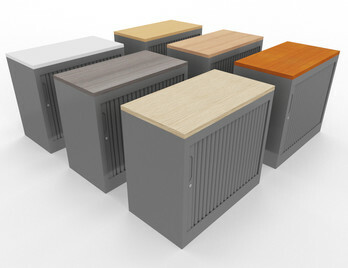 A tambour Cupboard can come in a range of different heights and shapes but what makes it a tambour is the ‘tambour door’. This consists of strips that can be either metal or plastic and are fixed together to allow the doors to flex and so they can easily slide round the back of the cupboard when opened. This prevents the danger of open doors that can flap in front or be broken and so ensures the safety of those using the cupboard. 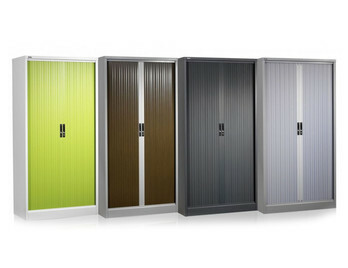 The innovative design of tambour doors also makes them the ideal choice for areas where space is limited such as office spaces or in schools and colleges well as in hospitality applications. 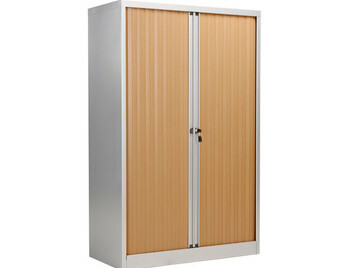 Tambour doors are also strong and ensure the protection of the materials inside. There are two main types of tambour – side openings and up-style openings. The side opening doors are the most common and this is where the doors retract sideways around the cupboard. 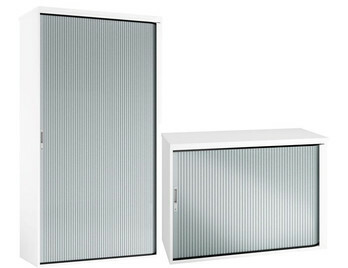 The other style – up – is similar to a garage door where the door retracts upwards. Both styles are suitable for a number of applications. 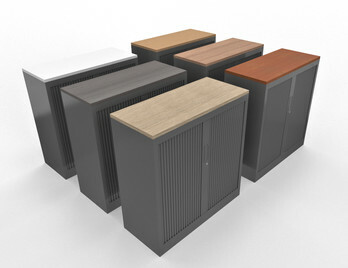 We provide a wide range of tambour cupboards in a variety of styles, shapes, sizes and colour options to suit your needs. 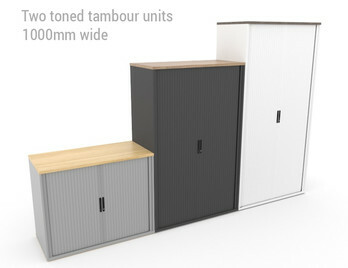 Buy tambour cupboards with confidence from Office Reality and get your order delivered free to UK mainland addresses.